The day started with an energizer and “stickers” exercise. Even that it looked as a game, it provided some conclusions very relevant for life and interaction between people and (cultural) groups; it refers as well with identity issues started yesterday, as stickers represent parts of our identity. The reflection brought us to explore what are the stereotypes and how they escalate till the discriminatory behaviours. The tricky story of “Tripas and onions” showed how easy is to fail in the trap of wrong mistakable assumptions caused by the stereotypes. “The danger of the single story” grabbed the attention by its authenticity and life relevant conclusions of Chimamanda. It summarized well the program block of Identity. “The problem with stereotypes is not that they are wrong, but that they are incomplete…” was one of the ideas. The author underlined the importance of knowing multiple stories and be critical thinkers not only to the others but as well to ourselves. After lunch it came the time to take a close look at the Living Libraries. Who are the actors of it? Who and how creates Living Libraries? What are the possible formats? There were few people in the group, who took part before al ready in Living Library as organizer, a book and reader… – there were as well some examples of the Living Library is not. The more experienced participants answered some questions of the other participants. The video gave extra example of the complete Living Library at school and its affects on the target group, in particular the school children, teenagers. 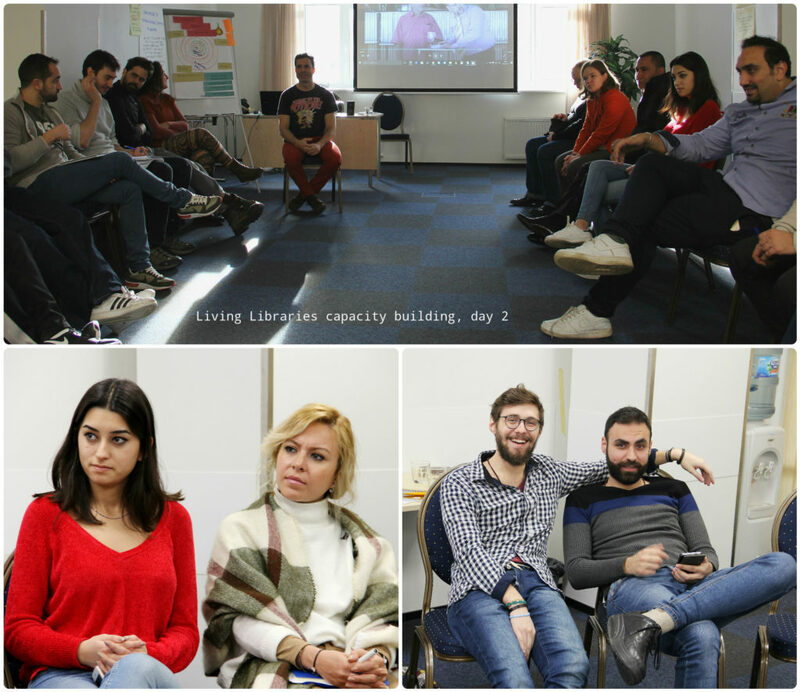 What are the expectations and demands/requests from all the actors of the Living Library to each other and how they should prepare themselves, – was the following focus of the 4 working groups. The last thing before ending the day was the launch of the dynamic of “Our Living Library”. 8 people decided to contribute as books and a team of 4 people – to take a role of Organisers/facilitators/librarians. Both groups start thinking and reflecting on what they would do at the tomorrow’s Library. The organisers and Librarians – the suggested format in the conditions that we are having and the books – on their stories to tell to the readers. The next day the intense preparation will take place and in the evening – the 3 hours Living Library it to be implemented. The day was special with that 3 videos were demonstrated and supported the learning of the group. On the other hand one of the most important process – the practical activity of the Living Library – started. We learnt the context and details of the Living Libraries. What are and the distinction between the stereotypes and prejudices. 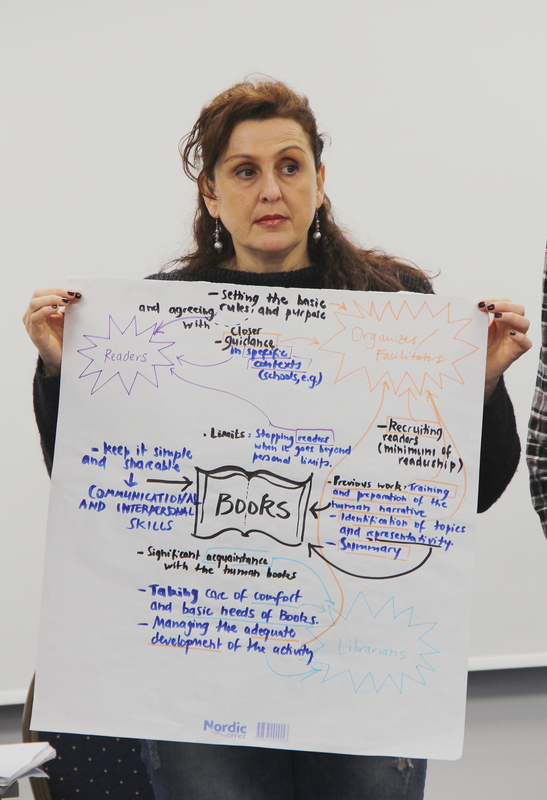 We learnt the tasks, duties, objectives of the actors of the Living Library through the working groups and practical experience of the people, who were already involved in the Living Library. Some ideas and reflection on how do we destroy the “single story”? Iceberg model to understand and define the Identity. The more complete knowledge on the actors/agents involved in the Living Library and its procedure. My past experience on Living Libraries was reinforced. The importance of multiple stories in order to combat prejudice and discrimination. We learnt the danged of the “single story”. How to organize Human/Living Library. Things are not always as they seem. It is the matter of the assumption and perception, which depends on who we are – what we are seeing. We should not identify anyone by a single story. Stereotypes and prejudices lead to discrimination. I could refresh my understanding of the concepts of stereotypes and discrimination and got more aware about these issues. People should not be judged according to their appearance, skin color, nationality etc.